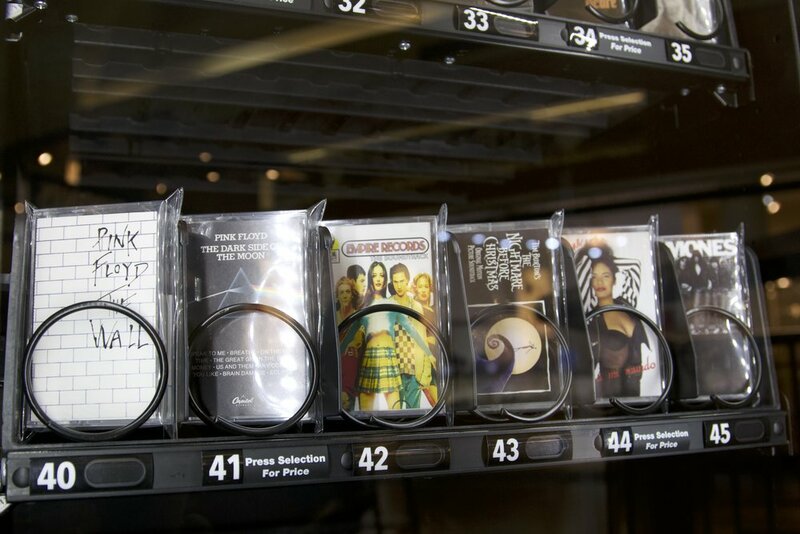 From the Edward Scissor Hands Soundtrack to Nirvana, the vending machine has a wide variety of cassettes to choose from. Imagine a vending machine filled not with sugary sweets or sodas, but cassette tapes. The Nine, an Austin-based music company, has created just that. A customer interacts with the machine, which is located on the second floor of Lakeline Mall near the food court. The tapes range in price from nine to 25 dollars,are play tested and range from iconic 90’s artists like Sonic Youth and Nirvana to movie soundtracks such as Space Jam and Beetlejuice. There are also new tapes from artists such as Mac Demarco, DIIV and Shannon and the Clams. As more and more artists begin to release their albums on tape, Purvis hopes to soon include music from local Austin bands. The invention of the cassette vending machines brings with it many positive changes to Austin. Considering it is one of the most creative ways of distributing music, through it, analog can begin to gain modern recognition, and support for local music right here in Austin can be encouraged.